Mike Dunn pulled off the biggest win of his career to shock world number two Mark Selby and reach the semi-finals of the China Open. The 42-year-old, ranked 71 places below Selby, won 5-3 and will meet home favourite Ding Junhui on Saturday. 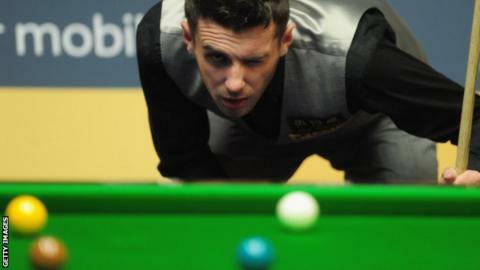 Ding beat England's Mark King 5-2 to remain on course to win five ranking events in one season. Ding continues his quest to win five ranking tournaments in one season. Defending champion Neil Robertson of Australia and England's Ali Carter complete the semi-final line up. Englishman Dunn thought about quitting the professional tour last season after struggling in low-profile events and qualifying tournaments. After his win, Dunn wrote on Twitter: "There's no words to describe how I feel right now except thank you to everyone. I am delighted and I've shed a few tears." Dunn will have to be at his best to compete with China's leading player Ding, who will become the first player since Stephen Hendry in 1990/91 to win five ranking events in one campaign if he triumphs in Sunday's final. World number one Robertson has been suffering from a viral infection but managed to overcome Scotland's Graeme Dott 5-3 in their quarter-final.